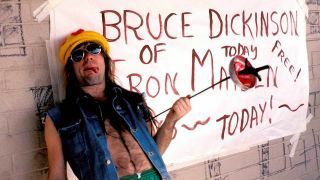 We know Iron Maiden singer Bruce Dickinson can do it all: Singer, writer, aviator, fencer, radio host, TV presenter, brewer, entrepreneur, veterinarian, taxidermist, surfing instructor (the last three aren’t actually true, but maybe one day…). Now he’s written a book, What Does This Button Do?, to chronicle his extraordinary life. And he talks about it all in the current issue of Classic Rock, where the subjects range from his spliff-smoking days with Samson, to why he’d never have returned to Maiden if they’d done the right thing in the first place and replaced him with a Finnish female. Below, we round up the best of Bruce Dickinson’s solo work (Spotify list at the bottom). Neither one of his greatest songs nor even really a solo number, this creaky slice of Hammer Horror heavy metal by long-forgotten London band Shots warrants inclusion as Dickinson’s very first recording. A curio, but one that pointed to greater things. The Dickinson solo career got off to a flying start with the glorious opening track of his debut solo album, Tattooed Millionaire. A brooding takedown of religious imperialism, it’s one of the finest things he’s written, with or without Maiden. Dickinson’s first post-Maiden album, 1994’s Balls To Picasso, was directionless and unmemorable, but it did produce this belter, featuring probably his best vocal performance since Maiden’s Hallowed Be Thy Name. 1996’s Skunkworks was the sound of a man trying to reinvent himself for the modern era. It largely fell flat, but it threw up a few lost treasures, including this mini-classic. Dickinson’s reunion with Adrian Smith on 1997’s Accident Of Birth found him reconnecting with classic heavy metal and brought Iron Maiden’s greatest songwriting team back together. With this galloping anthem, they wrote the best Maiden single of the 1990s. Dickinson doesn’t do ballads, but when it comes to stately epics, few can touch him, as this Aleister Crowley-inspired slow-burner from Accident Of Birth proves. 1998’s The Chemical Wedding was inspired by painter, poet and visionary William Blake, and the soaring title track flew on the wings of the angels Blake once visualised. Blake’s iconic poem (and English rugby anthem) was the song Dickinson was born to sing. In his hands, it’s turned into something new: part mystical treatise, part Celtic metal drinking anthem. Bruce’s feet were back under the Maiden table by the time of 2005’s Tyranny Of Souls, but he’d kept some classic tunes for himself, including this slice of part-acoustic, psychedelically tinged interstellar brilliance that sounded like nothing he’d written before. You can read our full interview with Bruce Dickinson in the latest issue of Classic Rock. Buy it online or become a TeamRock+ member to read it right now. Is there anything Bruce Dickinson can't do?